As you can probably tell, I have baby on the brain. I am starting to think about what to pack for my hospital stay and many people suggest bringing slippers or non-slip socks. Since I don't want to potentially mess up my beloved LLBean slippers, looks like I am going with socks. Unfortunately, just thinking about hospital-issue socks makes my feet itch so I decided to get creative and make some on my own. Here's what I used... white socks, puffy fabric paint, and some leftover cardboard to use as a template (roughly traced from my feet). Have a great day, don't mind my furry floors, and stay homey! Happy HUMP DAY. Sorry kids, this week is particular busy at work, so you'll just have to enjoy some of my ridiculous humor. Mom, if you're still reading, "happy hump day" means "happy Wednesday"...meaning...you're almost over the "hump" of the week. Get it? Get it? No? Ok. I'll call you later. I was talking to my friend Jen last night and she asked about the nursery. I said, "we got SOOOOO much done this weekend" and I think she was expecting me to say that we finished painting, hung up some frames, set up the crib, hand crafted a mobile, made a baby quilt, etc. Nope. We paid a local guy to scrape off the popcorn ceilings and rip up the carpet. 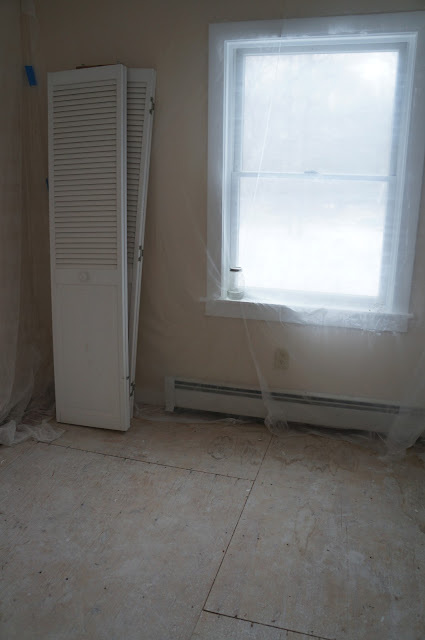 We decided to scratch the idea of covering up our popcorn ceiling with planks or beadboard because of all of the ceiling's angles from the dormer window - I was worried it would be hard to make everything look neat and even. As mentioned, we hired somebody to scrape off the popcorn ceiling in this room and I am SO glad we did. It took the poor guy all of Saturday and most of Sunday and he emerged covered in white dust, looking exhausted. While he was here, he also pulled up our berber carpet. The carpet was installed in 2010 when we bought this house, but my pregnant uber-nose could still smell the glue and chemicals used to install it. Concerned about off-gassing for the poor bebe, I nagged Jesse we decided to rip it up and go with hardwood flooring. Given that I have 9 weeks to go until my due date, things are starting to feel down to the wire. Pretty sure the only thing I could do to make this room less baby-friendly right now is add some asbestos and a hungry lion. 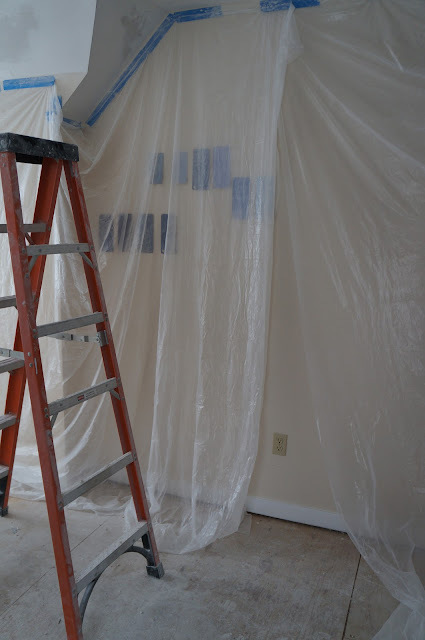 Our next steps are painting the ceiling and walls, choosing and installing hardwood floors, and then moving on to the decorating. Stick with us and stay homey! So remember that blueberry kale smoothie Caitlin made, way back when? This was inspired by that. I make this ALL the time. At least 3-4 times a week. I think it's absolutely delicious and totally refreshing. Anytime, literally anytime, I mention blueberries (which is like every day), my husband screams "BLUEBERRIES BLUEBERRIES" from the youtube video, "you forgot the blueberries." If you haven't seen this video...it's an absolute must. I've seen it maybe 300 times and I still laugh so hard, I cry. Put the kale in the blender first. Add the blueberries on top and then the rest of the ingredients. Blend until smooth. Kale - a fiber, mineral, and vitamin C, A, and K rich vegetable, kale is the earth's perfect food. Move over spinach, kale is what is UP. Blueberries - very high in antioxidants and a great source of vitamin C. Plus they taste amazing. Almond Milk - super high in protein and low in calories. A great alternative to regular milk. Agave Nectar - a low glycemic sweeter, agave is great for people on low carb diets. For example, white sugar's average glycemic index is in the 60s, where agave is under 30. Peanut Butter - fat helps keep us full longer and peanut butter has the good fat. It also has lots of other healthy properties like vitamin E, potassium, magnesium, and vitamin B6. Why do I add salt? A little salt helps bring out the rich flavors in the kale and blueberries and also helps balance the sweetness. It's totally optional, but give it a try. You know I wouldn't post this unless it tasted DELISH. So yummy. Stay hungry! Oh boy. Okay. This was amazing. Like kick your heels up and do a little Irish jig amazing. Let's just do a quick rundown, shall we. Bacon. Cream cheese. Cheddar cheese. GARLIC. BUTTER. CRISPINESS. Whew. Deep breath. Slow the breathing down. In...out...in...out. Seriously though, this was outstanding. I've been seeing different variations of this recipe pop up all over the place. I took a little bit of this and a little bit of that and made the recipe my own. Which just means that it's extra, extra bad for you. Ohhhhh boy. Just take a look at that. Yum. Here is the recipe. Let the cream cheese sit on your counter for a couple of hours until it's at room temp. Add the cheddar, garlic powder, jalapenos (leaves seeds in for more spice, or seed and only use 1 for less spice), and bacon in a bowl. Mix well. Spoon some of the mixture into the center of the chicken and then roll it, tucking in the ends. Use toothpicks to secure. Try to seal up chicken as best as you can so the filling doesn't blow out while cooking. Melt butter and then remove from heat and add panko bread crumbs. Season buttered breading with salt then spread out on a plate. Once chicken is stuffed, roll each piece of chicken in the egg mixture and then roll into the buttered bread crumbs. If some of the breading falls off, just pile some on top of the chicken pieces. Cook in a 375 degree oven for 30-35 minutes and go absolutely BANANAS. This is either going to strike you as the most practical or the most ridiculous post ever. Welcome to my brain. ...and speaking of buying stamps, I have bought stamps online for most of my adult life. When I lived in Boston, Seattle, & Brooklyn, I didn't want to wait in the long lines at the urban post offices. When I moved out here, I realized that I am a 15 minute drive to the closest post office and kept up the practice of shopping at USPS.com for my stamps and waiting for them to ship to my door. The shipping fee is inexpensive (seems to depend on where you are but is usually around a dollar) and I buy them in bulk about once a year which means I never have to search around for a stamp. Last year I bought a mixture of beautiful sailboat stamps (sadly no longer available) and "Go Green" stamps, which I realized too late came off as a bit preachy every time I mailed a letter. This year's stamps were mostly uninspiring to me (I am in no rush to pick up commemorative statehood stamps for states 3 time zones away or Indy 500 stamps), so I went with a classic LOVE stamp. Anybody nutty like me in support of the US Post Office and snail mail? Or have you not bought a stamp in years? Last night around five, Jesse and I were gearing up for an exciting evening of catching up on Downton Abbey. As usual, the dogs went out before they ate dinner. Fred came home about an hour later and Tillie (the basset we adopted last April) didn't come back. It was snowing and COLD and while we nervously watched Downton and kept looking at the clock, I started to worry. Jesse and I walked and drove through the woods behind our house calling her, but she was nowhere to be found. I could hear howling coyotes, but no lost lady basset. After a few hours of nervous sleep, we woke up and went back into the woods and made some flyers to leave in mailboxes. As soon as 8 AM rolled around, I called our vet and local animal control. Calling animal control seemed like a hokey thing to do at the time, especially since where we live many dogs wander around the woods and always return home. But two hours later, we had a call that she had been spotted a mile or so away. A woman had seen Tillie on her farm earlier that morning (I started crying JUST because this meant she hadn't been eaten by coyotes or bear), so this woman and I spent a couple of hours walking her property and searching the woods up by her. No luck, but on my drive back home, I spotted a tiny little basset ball under a pine tree. Tillie was nervous and hungry, but unharmed and safe. We'll be back to regularly scheduled posting tomorrow now that my crisis is averted. Take a sec to make sure your dogs' collars are up to date with your phone numbers and stay warm as temperatures drop like crazy today... and stay home, Tillie! Ever hear of that blog, #whatshouldwecallme? I'm obsessed and think it's hilarious. So much so, I decided to do my own little version, hungry style. Happy Monday. When people find out we're expecting a baby in April, the first question they ask is always some variation of "Is it a boy or a girl?". And, for the most part, they're usually excited for us when we tell them that we've decided to wait until the baby is born to find out. The "big surprise" is important to me, for a few reasons. On a practical level, Jesse and I know that we would like to have more than one kid. Not knowing in advance whether baby #1 is a son or a daughter helps curb the temptation to go out and buy Baby Gap out of tiny, frilly dresses or cute little man outfits. It also ensures that all of the big stuff we buy, from carseats to baby swings to cribs, can be used for future bebes. On a romantic level, I love the idea of Jesse running out to the waiting room and exclaiming "It's a ...! " to our families (our families who have, it should be noted, not pestered us at all to find out if this is a grandson or granddaughter, a niece or a nephew). I know there could be a middle of the night delivery or a long labor that could prevent all family from being present right after the birth, but I can dream. I have been busying myself with old wives' tales since July. I had terrible morning sickness and, later, cravings for sweets. A girl, for sure. But I'm carrying low... maybe a boy? I've analyzed the baby's heartbeat rates after doctor's appointments (supposedly girls have higher heart rates) but fluctuating heart rates mean no conclusive evidence. I LOVE guessing and speculating but always preface each appointment with "Just so you know, we don't want to find out!" and can't even bear to look onscreen during an ultrasound just in case the secret is revealed. In short, I am beyond excited for April. Jesse and I are simply hoping and praying for a healthy baby, whether it's a son or daughter. For now, I am stocking up on simple white onesies, with some blue and green outfits that could work both ways. I'm quizzing my mom friends on what baby items worked for them. I'm scouring Pinterest for ideas and eagerly awaiting the daily Zulily sales. So, pink or blue, I will be staying busy until April. Stay tuned for (many) more baby posts to come. There are no words to describe the depths of my love for this recipe. Toasty and hammy and cheesy and just OMG. I can't. I just can't. You guys remember my Super Bowl Dish of the year pick? Thanks to our dear friends, Colleen and Bill, this recipe entered our lives. Me being me, I half listened when they were telling me how to make it, so I made a few tweaks. See that yummy golden topping? You can thank our friend butter for that. Add 1 slice of ham and cheese each to each Hawaiian roll. Melt the butter over medium heat. Add the chives, shallot, mustard and honey to the butter and saute for 2-3 minutes, just until the ingredients begin to soften. With a pastry brush, add the butter mixture to the top of each roll. If there are shallots and chives at the bottom of the pan, gently spoon the rest of the mixture on top. Finish each with a sprinkle of poppy seeds. Bake at 375 degrees for 10-15 minutes or until the rolls begin to lightly toast and the cheese is completely melted. OMGGGGGGGGGGGGGGGGGGGGGGGGGGGGG. Make these now. My brother in law, Will, is staying with us for a few weeks. It's fun having him around. He likes to drink and eat...even more than I do. Anyway, he loves buffalo chicken anything. Remember the buffalo chicken cigars? Those were his idea. Then that recipe inspired a skinny makeover. Needless to say, a lot of my recipes have stemmed from his insatiable quest for the perfect buffalo chicken dish. I started browsing some recipes and decided to make a buffalo chicken mac n' cheese. UM. You guys. So good. It was cheesy and spicy and creamy and oh my. ...not to mention the buttery panko bread crumbs on top. Drool face. If someone calculates the calories in this dish, I'll have to kill you. Here's the recipe. You should make this. Like now. Cook pasta for 8 minutes, drain and set aside. You want pasta to be under cooked since it will finish in the oven. Melt 1/2 stick of butter over medium heat. Once melted, sprinkle in flour and cook for 1-2 minutes. Add milk a little at a time. Heat until it begins to thicken. Remove from the heat and let it cool for 2-3 minutes and then add the cheese. Add hot sauce and then season with salt. Once incorporated, add the pasta and the chicken and stir. Add to a casserole dish and top with some more cheese. Heat second half stick of butter until melted. Add panko breadcrumbs to the melted butter and stir. Top the pasta with the breadcrumbs and then cook in a 375 degree oven for 15-18 minutes or until breadcrumbs turn golden brown. Find the biggest fork you can and go to town. My oh my. Stay hungry! Charlie and I just got back from a short trip to Amsterdam. What a cool city. Filled with canals, winding streets, and sparkling holiday lights - the city was a dream come true. The food was ridiculously good. Everything. Amazing. My number one must eat in Amsterdam was panakuken, or pancakes. I actually made up a song about it. The lyrics were just "panakuken" but to the tune of the French Canadian childrens song, "alloutte." You can stop reading now. Anyway, they serve savory pancakes (in addition to a plethora of sweet ones) which is my kind of city. We ordered the ham and cheese one. I can't really describe to you how delicious this was. OMG drool face over here. It was chewy and cheesy and savory and salty and ohhhhh boy. So good. I'm going to try to figure out how to make it at home. I have a few ideas. Stay tuned. We also ordered mini pancakes with butter and powdered sugar. Um yes. This is sort of random, but we found a little Irish restaurant that served an amazing Irish breakfast as well as these spicy beef rolls. They called them "little firecrackers" - basically a mini egg roll with beef and lots of spice. I drank gluhwein all over the place. It was 50 and chilly, so a cup of hot spiced wine outside on the square was just what I needed. Like every 5 minutes. I don't think Charlie and I have ever REALLY disagreed about food until now. I have a fundamental issue with ordering fast food out of a vending machine. He seemed to enjoy the process, however. Ah, the french fries. These were scrumdiddlyumtious. Thick cut and fluffy. We ordered them with mayo like the locals but couldn't do it. Ketchup it was. This is oliebol! (O-lee-bowl). They are just as much fun to eat as they are to pronounce. These were served outside at little stands all over the city. These just happened to be in a bakery. They are little fried dough balls that they serve with powdered sugar. Yes, I got the powdered sugar ALL over myself. Needless to say, I could barely squeeze into my "fat jeans" on the trip home. Totally worth it though. Stay hungry! Jaisa's Pierogi Casserole from yesterday is a tough act to follow, especially since I am not known for my "hungry" posts, but bear with me for this incredibly easy and delicious meal. Also, it's super healthy. Because it features kale. Haven't you heard that every dish with kale is automatic health food? The beauty in this recipe is that you can use as much or as little of the ingredients as you like. I used an entire bunch of kale, which sounds (and looks) like a lot but it cooks down SO much and about three cloves of garlic. First, wash your kale and let it dry (or pat dry). Place it in a bowl and drizzle with some olive oil, adding your garlic, salt, & pepper. Mix the whole bowl up with your hands so all of the kale is coated. Turn out your pizza dough (I stretched mine out to cover a cookie sheet but you can easily make a round pizza if you're more into the dough-twirling-in-the-air scene. AKA if you have better hand-eye coordination than I do). A note on pizza crust: there are many amazing recipes out there but I usually buy uncooked pizza dough from my local pizzeria. It's like $4, saves time on making the dough, and turns out consistently delicious. Add some slices of fresh mozzarella cheese and bake at 400 for 20 minutes or until your kale is cooked down, the cheese is bubbly, and your crust is crispy and golden. While the pizza was cooking, I decided to add on a little chopped bacon to half the pizza for Jesse and his friend who was visiting for the evening and probably didn't expect to be part of one of my kitchen experiments. ("It smells really good in there, for, like, a vegan meal," said Jesse. Top with some parmesan cheese or a squeeze of a lemon and enjoy! Stay hungry, my healthy, kale-loving friends! Pierogies are one of my all time favorite things. In fact, when Caitlin was visiting me in Chicago we ventured over to the Polish neighborhood to pick some up. We have our Polish heritage in common as well as a deep love for potatoes, pasta, cheese and butter. The last time Charlie and I went to get pierogies it was a disaster. We swung by our favorite Polish restaurant and asked if we could get some of their meat pierogies in bulk. The lady came out with a GIANT bag and we were thrilled. Until we realized that only about 1 in 5 of the pierogies were meat. The rest were cherry. Charlie dubbed dinner time "pierogi roulette." Good times. Before I continue, I must provide a disclaimer. If you have any new years' resolutions that don't include gaining 10 lbs, pick up your computer and throw it out the window because this recipe is going to totally mess. you. up. I was reading one of my fav food blogs, How Sweet Eats and stumbled across her pierogi casserole. Child, this girl is cray cray. Begin by simmering your potatoes for 15-17 minutes or until fork tender. ...and add your onions. If you are familiar with pierogies, you know that they often serve them with caramelized onions on top. This is totally optional, but definitely adds that authentic pierogi flavor to the casserole. Please, please, please don't use preshredded cheese. It makes me sad and tastes like death. Buy a block and spend the milliseconds it takes to shred some up. It's totally worth it. I swear. When the potatoes are done cooking, drain them but keep them in their original pan to cook off any extra moisture. Next, add most of the cheddar cheese (leave some to top the casserole later), mascarpone cheese, caramelized onions, the milk, and 6 tablespoons of butter. Mash 'em until they are super smooth. If it's a little dry, add some more milk. This is the base of the casserole so just make sure it has lots of flava. Season generously with salt and pepper. Taste. Good? Good. Too good. Cook the pasta for a few minutes less than normal. I cooked mine for 8 minutes. It was very al dente, but we're going to be cooking it more in the oven so you don't want it to be mush. This is totally optional, but I threw in a little more cheese. STOP JUDGING ME. So...I added more cheese to the top and...ahem...more butter. Mostly because I have mental problems and because I thought it would taste good. After 25 minutes in a 375 degree oven...THIS IS WHAT I GOT. See that golden brown crispy cheese? That's how I know Jesus loves me. You totally don't have to, but I would suggest serving this as a side. It's so delicious but also so rich. A small amount goes a long way. I don't know how this is possible, but my mouth just started watering. It's just weird because I ate half the casserole about an hour ago. So I should be full...right? Normally I would garnish something like this with green onions or parsley or something green just to take away from the fact that this has negative nutritional value. The only thing I have in my house that's green right now is kale. Kale and this casserole shouldn't be together. In fact, they shouldn't be in the same stratosphere. So instead, I just used a green casserole dish. Who is the problem solver NOW? Alright peeps...I hope you enjoyed today's program. Stay hungry!